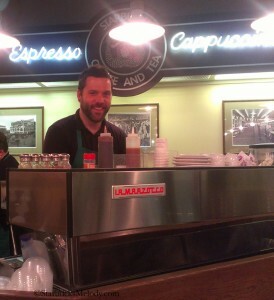 Starbucks Partner Chad Moore: Store manager of 1912 Pike Place. 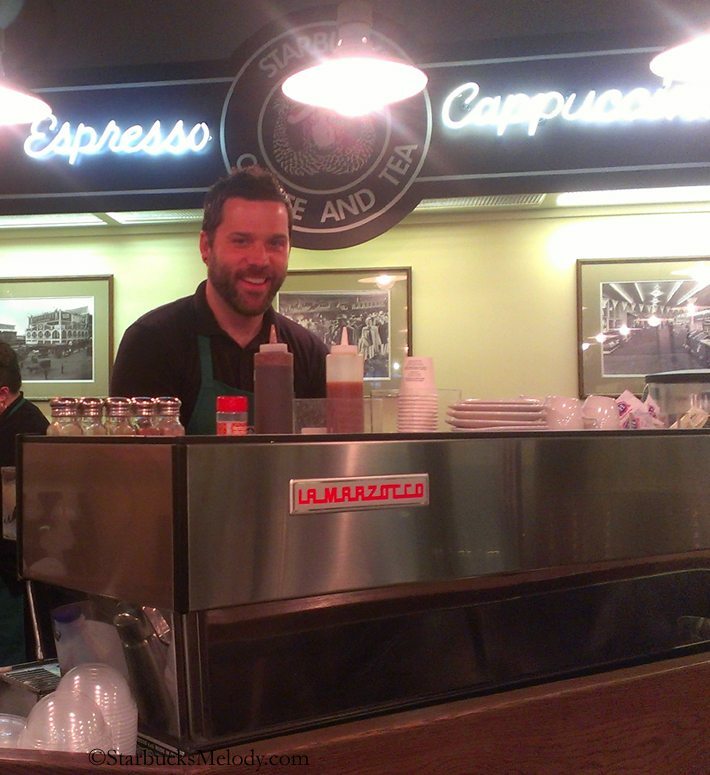 Chad Moore is the current manager of the 1912 Pike Place Starbucks. I have known him for about three years – ever since he took over that store in April of 2009. He is really an inspiring person to be around – you don’t have to work for Starbucks to feel better about your day just by being around him. I thought my readers would like to have a glimpse into his career with Starbucks, and his unique perspective as the manager of the world-famous 1912 Pike Place Starbucks. On September 24th, I had a chance to sit down with Chad and have a long conversation with him, taking notes, and recording it as an interview for this blog. Melody: I was wondering if you could tell me where you started with Starbucks? What was your first store? Chad: I started in Kansas City, Missouri at the Westport Road Starbucks. It was our very first store in Kansas City. It no longer exists. They closed it about a year and a half ago. I started as a barista part-time. Melody: What were you doing in Kansas City? Chad: I was going to school. I have always loved coffee – I used to drink coffee with my grandmother as a kid. She’d sneak it to me! The whole experience – drinking coffee – is very special to me. I was familiar with Starbucks. I’d lived in Pittsburgh for a while as well, and I was familiar with Starbucks there. Melody: What was your first day? Chad: 1998 – May, 26, 1998. Melody: Fourteen years ago, did you ever think you’d be the store manager of the first Starbucks at 1912 Pike Place? Chad: No. (laughs). I didn’t have any intentions of making a career out of Starbucks! I wanted to be a barista, and I wanted to work with coffee, and I chose Starbucks because I knew them. And, I fell in love with it. Melody: Where did you go from there? Chad: So while I was at Westport Road, I was promoted to shift supervisor. And at that point we were a brand new market. We opened one store, then another, and then five or six by the end of the year. The development track is a little different than here where we’re an established market. So I got promoted pretty fast, and became a shift supervisor six months after I started. And then I went to what I think is still the busiest store in Kansas City – the Country Club Plaza store. It’s in a huge shopping area, and all kind of Spanish architecture. So I went there – helped open that store. That was still 1998. Melody: I am going to ask you a question that I ask everybody. I go into a new store and I ask partners, “What’s your favorite coffee?” So I am asking you that now. Chad: Anniversary Blend has always been special to me, and my favorite. But if I think about a coffee that I love year-round, it is Pike Place Special Reserve. And not for the obvious reasons that I am the Pike Place manager, but just because it is an incredible coffee. And we don’t have anything else like it. And it is awesome as espresso, awesome in a press – it just stands up to every brewing method. Melody: I remember you telling me a story that you went to China with Starbucks. How did that happen? Chad: I got invited to go to China to represent our store – Pike Place Market store. It was there very first Leadership Conference ever for their store managers. It was super cool. I got to go as a special guest and represent Pike Place. It was really cool. They built a little mini Pike Place storefront. Melody: Were you there for the big marquee community service event in China? What did you do? Chad: I did a lot of planting flowers. I did some painting. It was really cool – It was like a huge — uh – I don’t know their technical term for it, but it was like a senior’s home. It was awesome. We made a huge impact that day! There were a lot of partners! Melody: How did you end up coming to 1912 Pike Place? I remember the previous store manager – Coreena – She wanted to take a leave of absence? She had a baby and wanted to devote time to her family … When did you come to 1912 Pike Place? Chad: I came April 8, 2009. April 8th or April 6th – It was one of those two days. Well, I just went through the normal interview process. At that time, I was at south Mercer Island Starbucks. I have been a store manager – out of the 14 years, almost 13 years. We knew that Pike Place was coming open. I showed an interest in interviewing and went through the interview process. I mean that’s really how it happened! Melody: Did you ever have your sights on that store? Chad: When I first started with Starbucks, back in the early days, we all read Pour Your Heart Into It. That was kind of part of the training. Kind of how Onward is now. And I was really impacted by that store. You know when you read that book from Howard, he’s very romantic about that store. And I kinda had that in me as a barista, even though I was miles away in Kansas City. I never thought I’d ever manage, or even work at that store, but I understood what that store meant. I was very excited to maybe have the possibility to get a hold of it. Melody: What is your next step in your journey? Chad: Well, I am currently working on becoming a district manager. Melody: What is magical about 1912 Pike Place? Chad: Wow. Big question. Well, one of the cool things is if you think about some days, I watch people wait in a huge line, it goes all the way down the street. Pushing and shoving. And some people can’t speak English. Languages from around the world. And I watch the anticipation of them wanting to get inside that store and some days that is very humbling. You know you’re like, “What am I doing?” I have those moments from time to time – you normally get into your busy day, and things happen, and the stress of the day, but there are those moments where I stand back and think, “this is so much bigger than I’ll ever know” and I think that really keeps you humble. And I watch my team. I have such a great team that really understands what we are creating. What experience we’re creating. We really create experiences like no other store. Melody: Sorry for jumping around. I did want to ask … how did you come to Seattle from Kansas City? Chad: I had some dear friends in Kansas City and his wife was from here. I wanted to move somewhere exciting, and change. Long story short … my really good friend’s wife was here, and said ‘you should fly out and check out Seattle.’ And I came in August. It was like crystal clear blue skies and 75 degrees. And I was like …. ahhh (insert relaxing noises here) … and it was like a hundred in Kansas City. And I said, ‘Why do I not live here?’ It was beautiful, and I got to see a lot of the city, and really how people live here. Luckily, I did it at the right perfect timing, because when I did, I opened the Pier 55 store on the waterfront. Melody: I know that Leadership Conference is coming up in Houston. Are you excited about going to Leadership? Melody: How many Leadership Conferences have you been to? Chad: I don’t know – like seven or eight. Melody: So what will you be doing there? Chad: I will be participating just like everyone else! Leadership is really a great time to get a re-charge. And get inspired, and it’s all about the store manager – I am just really excited. It’s really awesome to see people who are doing the same thing you’re doing all over the country. Meet them, talk to them. I typically go to leadership with an open mind, and I have a journal and I am ready to take it in, you know. It’s a great bonding time. Melody: How many people work in that store at any given time? I’m just thinking that store is really small! Challenging navigation. Chad: During our peak busy summer season, we run a 17 person deployment. Melody: How many employees total? Chad: At my peak, 35. Melody: Are most people tourists? Coming in for collectible items? Or going to the bar and getting a beverage? It’s almost the Disneyland of Starbucks. Those are the people that will buy merchandise, get their drink and then even though it’s crowded in there – they’re getting poked and pushed – they’ll stay in there and savor it. For those reading this who are lucky enough to go to Leadership Conference in Houston, I hope you’ll find Chad and say a big “hello” to him. For the partners reading this blog, I recommend that you follow the Twitter profile @StarbucksPrtnrs tweeting many tweets that are geared towards the partner experience. Thank you Chad for the many great experiences in Seattle. Too Wonderful Not to Share. Melody thanks for this great interview with Chad. I have been to this store but not when Chad was there. I absolutely think he would make a great DM and I wish his energy could be transferred to some of the SM around here. The connection has to be there with his team, with the store, with the customers for it to all work and I can see he has that. Thanks Chad for showing your passion for the brand. @Purple1 – Glad you like it. I have seen a number of tweets of people who enjoyed this, and there are some Facebook comments too – I wish people would comment here. 🙂 Nonetheless, I am glad that this is reaching and inspiring people. Hi Melody, this was an interesting intro to and bio of Chad. I like to observe the team work at Starbuck’s as I wait for my order. I’d also be interested in their leadership training in a future blog. @Melody – great interview with Chad and I hope you can do more. Very nice interview with Chad. Too bad they can’t clone him! Many companies would do well to have people like him onboard. Someday I hope to get to Seattle to see that store. thank you melody for a great interview!!! one of my starbucks fantasies is to phantom at the pike place store some day – but a 17 person deployment?! that’s intense, since at my store the most we work with is 4, but now i want to work there even more!!!! So many great comments! This honestly is one of my favorite blog posts in a long time. Jocelyn, Seattle awaits you with open arms, but you should move up here fast and work at 1912 Pike Place before Chad goes on to become a district manager! Nice article Melody. Chad runs a great operation at the market. Starbucks would do well to have someone like him as a DM. $9000 a week? Is that supposed to be a day? A week would be really really slow. It must be a day there’s no way you could have 35 partners at such low numbers! I believe she actually meant to type 9,000 without the $ – which would make since, because the question was “How many transactions?” not “How much in sales?” which would be confidential anyhow. yeah, that was defiantly supposed to be 9000 transactions a day. I am always curious what stores like that do. 9000 a day? That’s just such a large amount! I have to think that the 17 person deployment is for an entire day, I’ve seen that store, I don’t think they could even fit 17 partners at one time. I removed that part of the interview – I am not really sure that I got it right, and it’s best not to create any more confusion. Oh my god I remember working with Chad and Shalom for my first Starbucks Coffee Gig.. I am so happy to see him doing so well! Congrats Chad! This is so nice to remind me of the day I visited pike Starbucks for a trip. But I’m not sure If I saw Chad, because there were a tons of people. @Juliana – I’m sorry but he’s not at 1912 Pike Place anymore. He got promoted into the corporate headquarters. A good thing for him, and it’s awesome that he’s still a partner, still a little sad though that he’s not there at 1912 Pike Place. awesome! so inspired. but 17 person deployment? now that’s a challenge.